Woods, in only his third tournament since returning from back surgery, said he jarred his lower back when he hopped into a deep bunker. LOUISVILLE, Ky. – U.S. captain Tom Watson said Monday that Tiger Woods’ latest back injury “doesn’t bode well right now” for Woods playing in the Ryder Cup. Woods flew home to Florida on Sunday to be evaluated. It was not clear when he would know if he could play at Valhalla, where Woods won the PGA Championship in 2000. His caddie was on the course Monday. Woods, in only his third tournament since returning from back surgery, said he jarred his lower back when he hopped into a deep bunker after playing an awkward shot from the slope of the bunker on the second hole at Firestone. He tried to keep playing and hit some shockingly bad shots – one into the water on No. 3, another on the par-3 fifth that was 65 yards short of the flag. 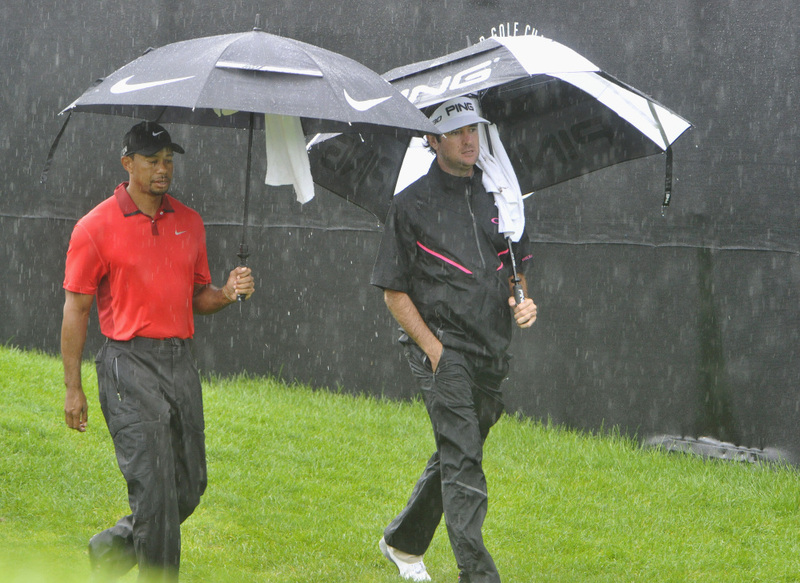 Woods missed two majors and three months of the season after March 31 back surgery. He has no chance of making the Ryder Cup team unless he wins the PGA Championship. If he can’t play this week, that would be the end of his PGA Tour season until after the Ryder Cup.